What is GNC Herbal Plus Turmeric Curcumin 1050mg? Turmeric is a natural supplement that has been used for generations. Its roots come mainly from India and it has made its way onto the mainstream pharmaceutical market for its ability in achieving results. GNC Herbal Plus Turmeric Curcumin is one of the many suppliers of natural turmeric supplements whose goal is to rid the body of harmful free radicals by being a powerful antioxidant. GNC Herbal Plus Turmeric Curcumin is pure and all natural. Its only property is turmeric root extract which compromises of 1050mg, 95% of which is Curcuminoids. However, it is a well-known fact that the absorption of curcumin is not so easily done by the body which is why the inclusion of BioPerine is added in order to assist with absorption. GNC Herbal Plus Turmeric Curcumin does not contain BioPerine and customers will have to seek assistance for absorption through other supplements. Other ingredients include Cellulose and Vegetable Acetoglycerides. 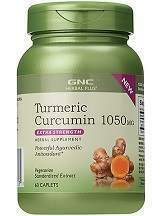 GNC Herbal Plus recommends that its Turmeric Curcumin supplement is taken once a day. There is no information available on whether optimum effects are affected by taking the supplement at specific times of the day or with meals. GNC Herbal Plus Turmeric Curcumin comes at a price of $54.99 and is good for a 2-month supply. But with an annual membership fee of $15, the price goes down to just $49.99 per bottle which saves you money in the long run. Also, a current offer on the website states that a second bottle will be half price. Side effects may not be directly related to GNC Herbal Plus Turmeric Curcumin as a supplement, but to Turmeric in general, as it has the potential to cause nausea or diarrhea when taken in high doses. Make sure you stay within the dosage specified by GNC Herbal Plus for their Turmeric Curcumin. Caution has been advised to pregnant women and breastfeeding mothers as there is not enough evidence to suggest whether or not GNC Herbal Plus Turmeric Curcumin is transmitted to the fetus or through breast milk. Furthermore, warnings have also been put in place for people with debilitating medical conditions or those who may be taking other medications as there have been no studies on Turmeric Curcumin’s contraindications with other medications. It has also been advised that the usage of GNC Herbal Plus Turmeric Curcumin is stopped 2 weeks prior to any upcoming surgery. You are able to return products, both used and unused, and you will receive a refund in the same form of payment that you bought the product. You will receive a refund within 30 days of GNC having received the returned product. There are reviews for GNC Herbal Plus Turmeric Curcumin with the option of leaving a new review and rating current reviews; all reviews on this supplement have been positive so far. The standard dosage in order for Curcumin to be effective should be standardized at 95% at least and GNC Herbal Plus Turmeric Curcumin meets this standard. However, absorption matters just as much as the constituents of a supplement and Curcumin is not easily absorbed. This supplement does not contain any additional ingredients that can aid with absorption which could leave people guessing on how much curcumin actually gets to the bloodstream. There is no information on the website which indicates that the effects of GNC Herbal Plus Turmeric Curcumin has been proven through trials or research studies, and there is also no support or approval from any third party institutions.